I ADORE Art Journaling and Mixed Media. In fact, when it comes to tactile arts and getting messy this fills my happy well far more than scrapbooking ever did. It still involves cutting and pasting but it adds painting and collaging and making glorious messes. Not to worry, scrapbooking is still a huge part of my life, just in a different way. So, Cheri, what are you doing this year to pursue your Art Journaling? Well, thanks for asking! I've got two classes on tap this year. First is the Documented Life Project. It is a weekly prompt class with limited technique instruction via guest bloggers. It has the advantage of being FREE! Free is a really nice price. Last year DLP was done in a moleskine weekly planner. This year they've ditched the planner in favor of the large Dyan Reaveley Creative Journal. The prompts are geared to straight art journaling, not to documenting a week of your life planner style. I have a very small (3.5" x 6") weekly planner that I carry in my purse for keeping track of appointments. I've decided to add some tiny little bits of life (tickets, receipts, stamps, product wrappers, etc.) and maybe some washi tape and doodling to that little book. Just for fun. The Creative Journal has the advantage of nice thick pages that hold up well to most media. It has the disadvantage of having a LOT of space to fill (a two page spread is roughly 18" wide by 12" high)! I've been leaving it out on my art table and adding layers every time I have ten or fifteen free minutes. Week One - the prompt was "book paper" and the theme was "Be your own goal keeper". Since my goals for the year are so intimately connected to my One Little Word "Thrive" I chose to use that quote for my page. Week Three prompt "Color Wheel" and the quote provided as the theme. I started with a dark wash of colors (quite by accident because the medium I was using did not do what I thought it would), but then dry whitewashed it all with gesso, very purposefully making sure there were lots of scratchy brush strokes visible. My very loosely interpreted "color wheel" is created with magazine clippings of flowers and color swatches. Week Two's prompt "Gesso" and theme "Beginning". I started with a coat of gesso, then added Tim Holtz distress stamp pads in a watercolor style blending mode. Spritzes of water create a mottled look. Some stenciling... and then ... I created the roses all around the edges using the bottom of a bunch of celery as a stamp, painted with acrylic paints. Work got so busy at the end of January, I didn't do the week 4 and 5 prompts. I'm choosing to skip them. I'm working on week 6. While I am striving to keep up with the class, I am not worried about doing a page every single week. If I average 3 spreads a month by the end of the year, I'll be very happy! My second class is Artfully Inspired Life 2015 with Joanne Sharpe. This class is also set up to create a year long art journal. Lessons are posted once a month to create four weekly pages around a monthly theme. The cost is $59 for the entire year. What is being "taught" is whimsical lettering styles, something I've been wanting to learn. After viewing the January class material, I chose not to create the actual journal for the class. Joanne has the entire year mapped out with what goes on every page of the journal. Part of January's assignment was to create the table of contents page and number all of the weekly pages. That felt too restrictive for me - I have this terrible habit of wanting to make every project my own! Instead, I'm simply going to incorporate techniques I learn in this class into my DLP journal. For example, the lettering in the third spread above is my take on the February calligraphy exercise, using calligraphy markers. So that's how I'll be pursuing my passion for Art Journaling in 2015. Do you art journal? How do you devote time for it in your busy life? I'm following the journal with Joanne, but am seriously behind already. Pretty sure I'll be able to catch up, and although I'm eyeing the DYL prompts, I haven't managed those because I'm still working on the last few sketches for Liz's class. Being sick the whole month of January put me seriously behind, and the beginning of February has been super busy! 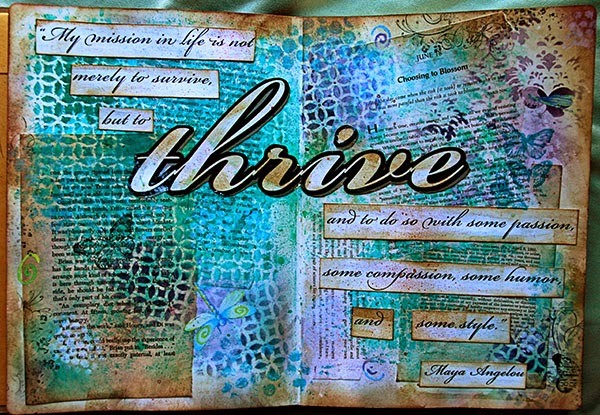 Love your pages; saw Thrive on Facebook I think, and love the colors and design of the last one. I've yet to figure out how to create that soft look you've got there. Your pages are very beautiful, Cheri, and I comment you for working on your art journal. My art journal has been neglected for so long! It seems I'm always lacking time to sit and work on it, there is always so much going on or I'm downright tired. I've learned not to take that many classes - I still have classes to finish from last year! I did a free photography class in Janaury through the Open University in Australia, it was very good and I learned a lot, but I'm also glad that it is over. I was on it every day, usually early in the morning, and it was quite a stretch. Now I only have one yearlong class, and I think I can manage that. I admire how you set your goals and then pursuit them. Your pages are beautiful! 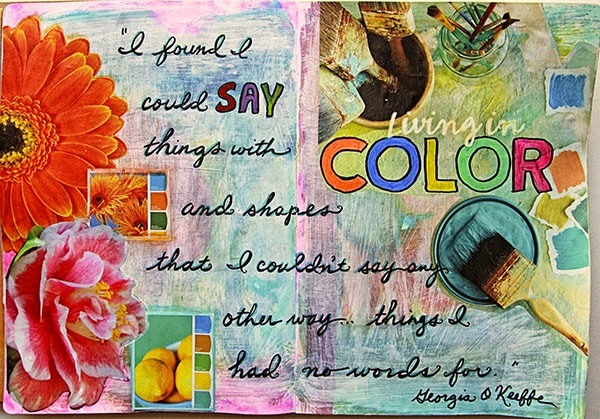 I haven't tried art journaling, but I do enjoy looking at what others have created. You and I are walking a similar path. I"m also exploring my creative passions right now, but I"m doing it month by month. Focusing on each one to see how much it still calls to me and where it fits in my life. I've discovered the kind of sketching I want to do (quick, not realistic) and am focusing a lot of scrapbooking this month. I think art journaling is on tap for March, and I'm looking forward to focusing on that. Plus there's photograhpy, which to me is at the heart of it all.I scrap photos; I incorporate my photogrpahy into my art journal pages; I sketch the images I photogrpahed, etc. I love your pages. I'm three weeks behind as well and taking the same approach to it as well. I saw your celery flowers in the Facebook feed and thought they were great and so clever to think of it. Happy journaling. 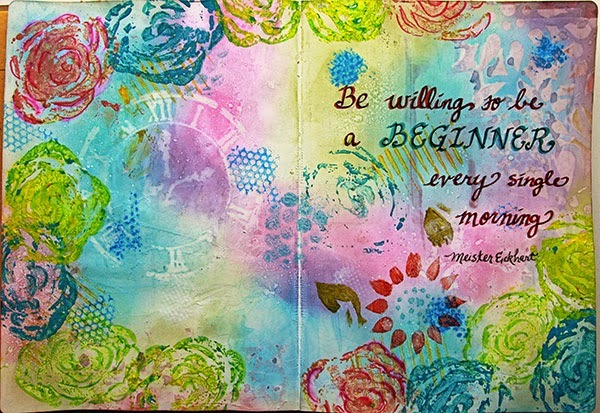 What a great post about your art journaling passion Cheri! I like how you are incorporating the two & giving yourself permission to create a number of pages that works for you each month. I like all of these pages, but I think the Thrive on is my favorite since it's perfect for the start of your year & art journal. I'm hoping to do a little more mixed media this year - some canvases & some art journaling.